Like most recipes in my life, this one starts and ends with the sauce. That velvety rich, fragrant, warming Thai yellow curry sauce with hints of coconut sweetness, flecks of green cilantro, delicate little strings of fresh ginger, punchy turmeric-yellow color, and a decent kick of Thai chile heat. It’s just barely thick enough to be like a creamy curry gravy but still saucy enough to make its way in and around every grain of rice. Perrrrfection. So just give me a second to catch my breath. Now, the actual curry, right? 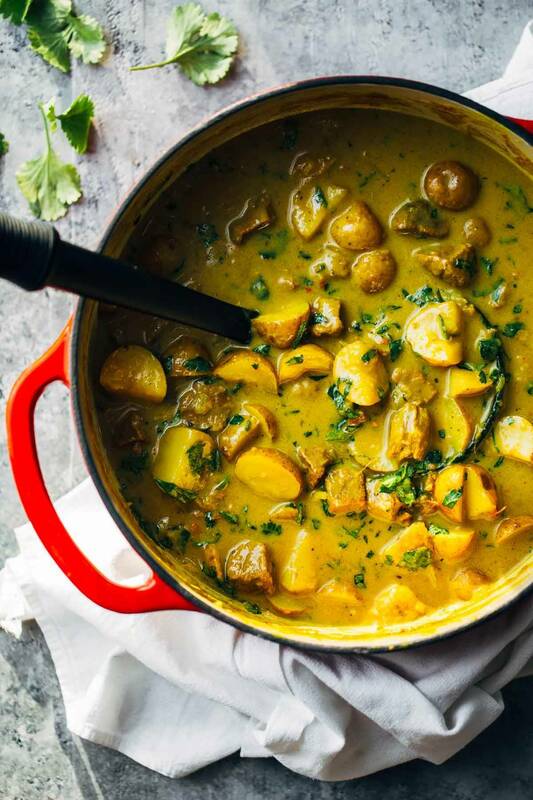 Think about that glorious Thai yellow curry sauce blanketing comforting-ly soft bites of Yukon gold potatoes, thinly sliced and sautéed shallots, and tender chunks of slow-simmered beef. And wait wait wait though. It’s all piled over a bowl of fluffy, fragrant, steaming Jasmine rice. Food dreams complete. I would just like to point out that somehow, when I was distracted by the Thai yellow curry sauce, chunks of beef (as in b-e-e-f, like red meat, like the stuff I never hardly ever cook or eat) snuck into my food dreams. What in the what? Superweird, but no time to question it. MORE CURRY NOW // MORE CURRY NOW // MORE CURRY NOW. I’ll just start by saying I don’t normally cook recipes that involve a special trip to a special grocery store or require more than 20 minutes of prep. You know that about me. But I made this recipe for a special occasion last week: my newly started dinner club with friends! And here’s the thing about this Thai yellow curry recipe: it’s 100% from scratch. you will literally make the curry paste from scratch. like, pulse it all together in your very own food processor or blender. many readers will now leave this blog. even if it doesn’t turn out like you were expecting, making a curry from scratch makes you feel like THE MOST AWESOME cook. because you are. 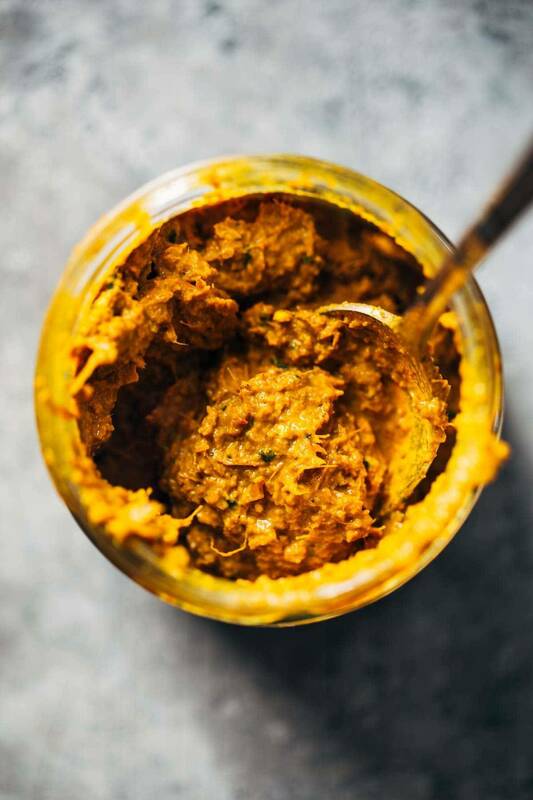 you will be giving yourself the gift of homemade yellow curry paste for at least two more recipes, because as written, you will end up with extra curry paste for later. this might actually be my favorite thing about the recipe. you might have guessed, and you’d be right – this recipe requires a trip to an Asian grocery store. unless you’re the person whose mainstream grocery store sells shrimp paste and galangal, in which case you are a very lucky duck. you don’t need to be a really fancy cook to make this – it’s really straightforward and at times it’s even hands-off. you will just need TIME. like, a few hours. save it for a Saturday or divide up each of the steps over a day or two. And now, a close up shot of the curry paste because I’m a food blogger. Exhibit A: the photo above shows what one hour of cooking time looks like. Coconut milk, beef, pan, one hour, go. I actually made and photographed another whole recipe during the time that my beef was just simmering away and getting all wonderful in that buttery coconut milk. And all the multi-taskers rejoiced! You guys, I can’t even tell you how much fun I had making this for my friends, but really, just making it for me. Most of my life revolves around food that is quick and easy and I’m always always always looking for shortcuts or ways to save time. So to have a time where I said – hey, look, I’m going to dedicate five hundred days to this just because I love cooking new things and because this is a life experience and because curry somehow runs in my Minnesota veins – was unusually therapeutic for me. Truthfully? I don’t expect most readers to ever make this. It’s not practical. I totally get that and I almost felt like maybe I shouldn’t post the recipe because it’s such a beast. BUT. If you love curry. If you love cooking. If you love watching something be created from nothing. And if you can find a few hours here and there over the course of a few days to get this all put together, you and I should probably talk. I wish the best of the best of the curry worlds upon you, sweet readers! Go forth and enjoy this treasure of a recipe. Thai Yellow Curry with Beef and Potatoes – made from scratch! Perfect creamy comfort food with huge flavor and a kick of spice. CURRY PASTE (one hour): Heat a cast-iron pan over medium high heat. Wrap the garlic and shallots in foil (with their paper on) and place on the skillet for 25 minutes, flipping once half way through. Remove from heat and cool, and roughly chop. Set aside. Layer the ginger and galangal in a single layer and wrap with foil. Place in the skillet and heat for about 10 minutes flipping once halfway through. Place garlic, shallots, ginger, galangal, and all other ingredients for the curry paste in a blender or food processor. Pulse until mostly smooth. Use water from the chiles to help the mixture run through the blender as needed. This will make a little more than 2 cups – set 3/4 cup aside for this recipe and freeze or refrigerate the rest for later. CURRY (one hour): Heat the coconut cream in a deep pot until bubbling and starting to thicken a bit. Add about 3/4 cup curry paste and simmer for 5 minutes. Add the potatoes, shallots, beef, and 1/2 cup of the reserved coconut milk from step two. Stir in 3 cups water. Simmer for 30-45 minutes until potatoes are tender. Add the sugar, fish sauce, cilantro. Serve over jasmine rice. As written, the recipe is exactly how I made it for my friends. But it felt a little greasy, so when I made it the second time I opted for coconut milk instead of coconut cream. The results were really good other than that it was very very very spicy. I would consider it medium+ if not straight up hot. So if you’re going to sub coconut milk for coconut cream, reduce the amount of curry paste to 1/2 cup or less (you can always add more later if you want). PS. I’m anticipating questions about using store bought yellow curry paste, because I wondered the same thing myself. Honestly, I don’t remember the last time (if ever) that I’ve used store bought yellow curry paste so it’s really hard to me to say if that could be used in this recipe with similar results. I think it could? but I make no promises. Please leave a comment if you try it with the store bought paste so others know how to best adjust the recipe. What would be a good substitute for shrimp paste? I’m allergic to shrimp, crab, and lobster. Terrible curse when you live on the east coast! Gosh, I have no idea. This is only my first time making curry paste from scratch and I followed it almost to a T, so you might have to consult the google machine on that one. Hi i am Thai. You can used fermented tofu (thai version) for subsitution. It is called “tua noa” in Thai. It comes in the dried layer, look alike digestive biscit. I am not quite sure whether it is availble there or not. However somebody told me that you can use Indonesian version which is called tempeh too. That curry paste looks really impressive! Not what I was expecting at all. I feel like complex recipes are good so I can learn how to advance my cooking. And I think it would be very therapeutic, like you said. That’s always time well spent. Looks beautiful! I really love your counter top and the amazing texture it gives to you photos! So pretty. I’ve only cooked with curry once. We used to eat curry almost every day on our overseas trips to Hong Kong. It was a staple at the place where we would get lunch. So, I eat curry, but I just never seem to make curry dishes. Time to change that because this looks so good! Hi Lindsay! These photographs alone are stunning! Alone for that the post is worth it xD They look like you could make a calendar from them or hang them in your kitchen =) Especially the close-up of the curry paste! Don’t you worry – I will not be scared off by a trip to the Asian grocery store and a long list of ingredients – I WILL be making this! I used to live in the Middle East and our nanny would make us these gorgeous Sri Lankan curries on a regular basis, properly from scratch. Then I got into making my own Thai ones, and when I moved back to Canada and saw curry paste on the grocery store shelves, I was like, “What?!?! That’s cheating! !” It’s been far too long since my last homemade one and you’ve inspired me to change that! Hi Lindsay! Firstly, LOVE the blog! I check it daily 🙂 So, I am not a big fan of beef… but do you think it would be possible/as yummy with chicken?? I would love your advice! Can’t wait to try it! Yes I do! But I wouldn’t cook it the same way – I think it would dry out. I’d just saute it with a little of the curry paste, like you would normally cook pieces of chicken. It’d be safe to simmer chicken thighs or drumsticks for 45 minutes without worrying about drying them out. Love this!! I often look at condiments and wonder if I can make them myself. I am pinning this and definitely going to try it out. I like the comment about freezing extra in ice cube trays – great idea to keep curry paste on hand. Also, re the comment about not using beef – not sure what you think Lindsay but in my opinion currys can easily be made with any protein or even all veggies. Try them out with chicken, shrimp, tofu, or chickpeas and veggies. Thanks for posting this!! Agreed! I make veg curries all the time. I actually prefer beef to chicken or shrimp if I’m going to put any meat in there at all. Well, I’m definitely rejoicing because I LOVE curry!! Yellow, green, red it don’t matta! I wanna grab this bowl right through the screen! I’m so glad you can appreciate a good Thai yellow curry from scratch with me. These pictures are RIDICULOUS!!! The recipe looks insane too, gorgeous! Can’t wait to see you guys speak again at Food Blog Forum! This looks so delish, thanks for sharing! This look soooo good and your pictures are amazing. I love your blog. In love with the sauce!! Thanks so much for this! A good curry definitely benefits from a bit of time and effort. Sounds fab. Yay! I make my own curry powder from scratch (http://goo.gl/3v9Hg2) and I’ve been looking for a curry paste recipe to use it with. This is perfect! And I totally agree about it being bizarrely therapeutic- I find the same thing with toasting/grinding whole spices to make curry powder. It smells so good! Kudos!! I love love curry so much. You’re much more courageous than I to attempt homemade curry paste. How much does it make / how many recipes can you get out of one go? I’d love to try it out and want to maximize use 🙂 Thanks for sharing, I’m still with you! This looks SO amazing. The color is gorgeous…yum, yum, yum. 2 weeks for the paste in the fridge – but I actually have mine in the freezer now! We’ll see how that goes! I totally get the hour cooking time. My husband is from West Africa we consume massive amounts of peanut butter soup and various leaves that require 1-2 hours to prepare. I generally take a run on the treadmill while the meat boils into oblivion. I love experimenting with curry. I’m still working on getting the ropes of it, but it looks like this recipe will be great practice! I have an Asian market a block from my house. I buy 80% of my produce there. So the ingredients are definitely accessible. Orrrr, I can just shop my sister and Filipino BIL’s house. I know they have shrimp paste in the cupboard. 🙂 I’m all over this one. 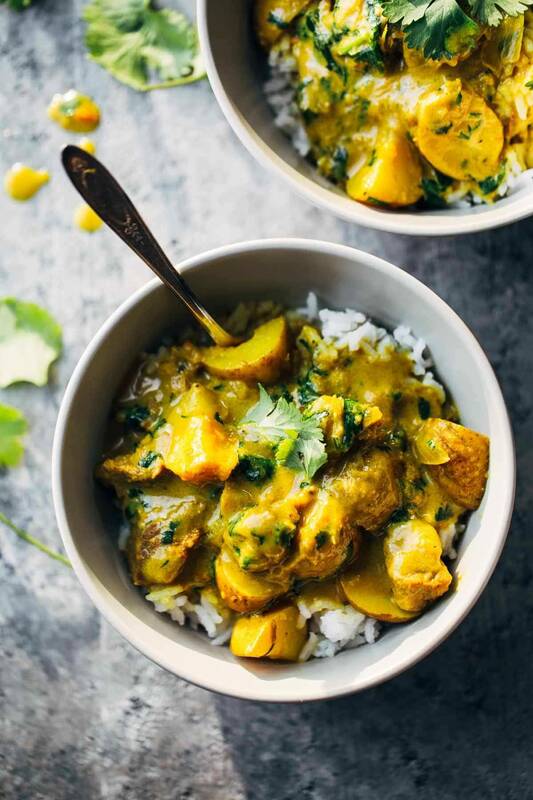 So glad you shared this- I am obsessed with curry and especially the combination of beef and potatoes! I love how you made it from scratch- I’ve done it once before using mum’s recipe which reminds me to do it again- So much better than store bought! Cheers for this!